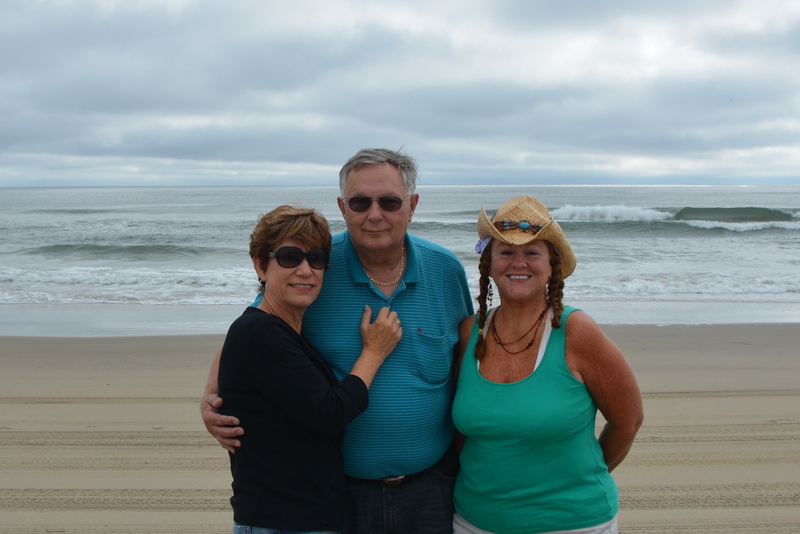 Motor Man and I were on/in/at the Outer Banks last week, and it just so happened that my friend, Donna, was also there on vacation with relatives. 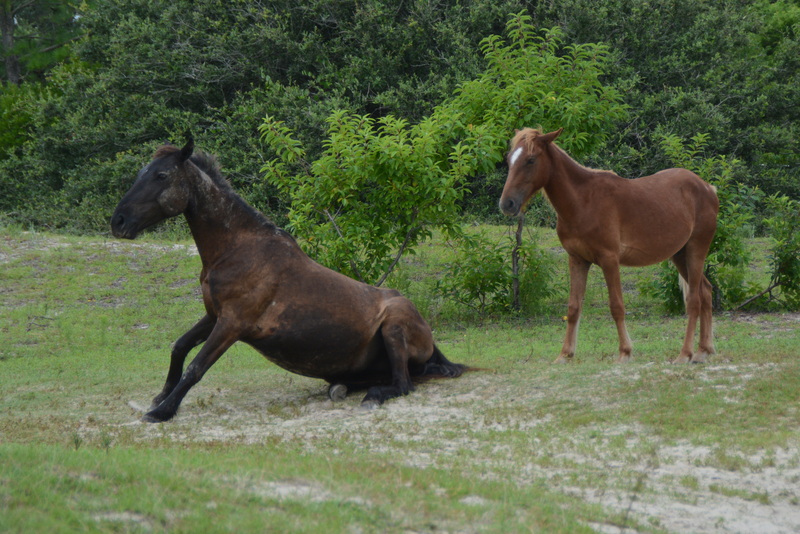 As much as Donna loves horses, she had never been to the Corolla area to see the wild horses. So we were happy to introduce her to “my” horses. We saw twelve during our morning on the beach, including these two. Donna said that she thought it to be a mother and her young colt. Perhaps the two of them realize that soon, he will be forced to leave the harem and find a mare of his own. 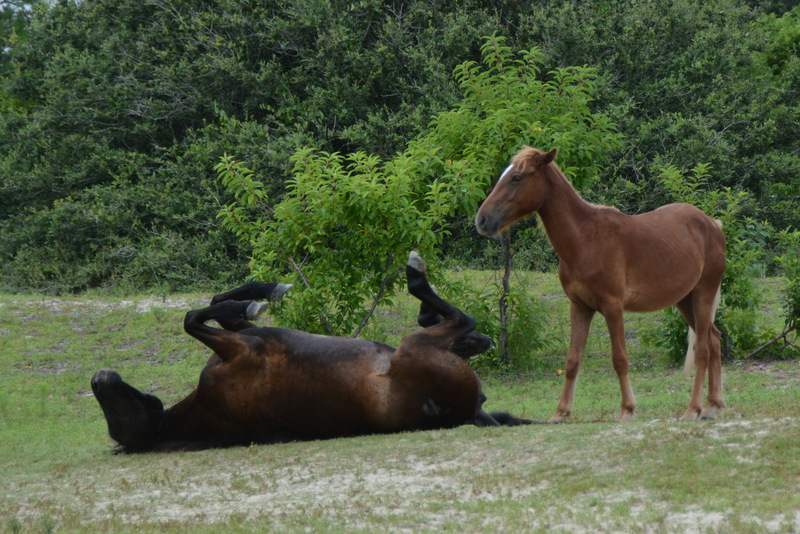 Then Mom decided to roll over and have a good back scratch. I love to see them do this; it must really feel good to kick up your heels like that. (groan)….time to get up…. Oh wait, that’s the sound I make when I get up in the morning…. As much fun as it was to see those two, this is probably my favorite picture I took that day. 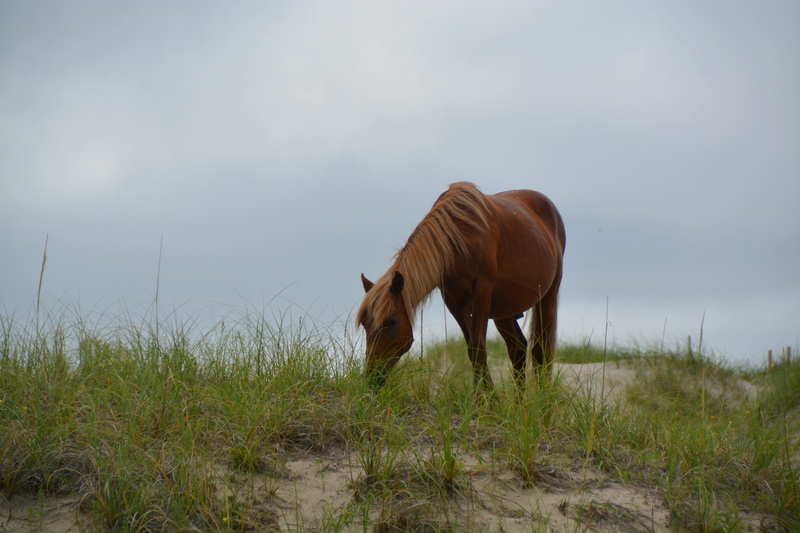 We also saw this “Beach Boy” up on one of the dunes. What a fun morning the three of us had. And Motor Man was such a good sport, putting up with our antics. And the horses definitely have a new fan. 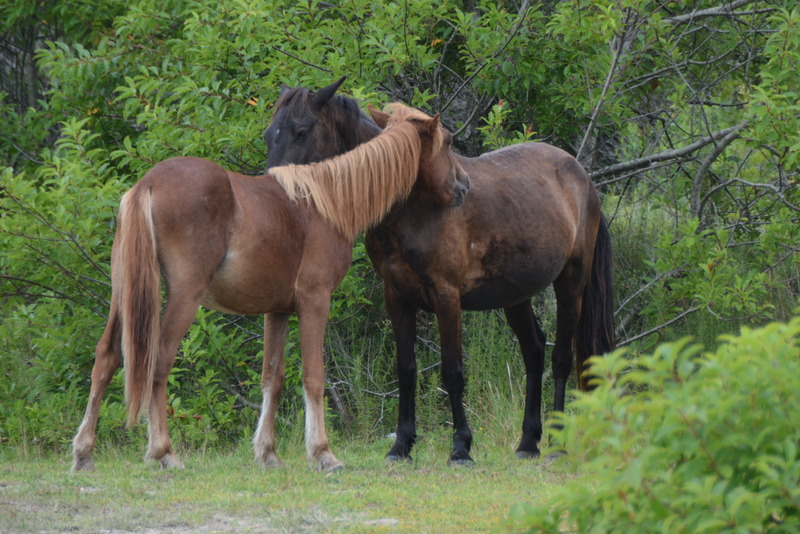 This entry was posted in OBX Wild Horses, Traveling Days and tagged corolla wild horses, obx wild horses. Bookmark the permalink. Nice that the three of you had such a great time enjoying YOUR horses! I’m with Beth Ann. I must visit the Outer Banks one day…or a weekend. Sounds like a wonderful day! Beach Boy is very handsome.. 🙂 Friends, horses, and the beach.. perfection! So glad the horses were out and about for Donna to see. I’m sure JR had some antics to match yours and Donna’s!! I would love to see the wild horses in person! Fabulous, fantastic photos. I love them – the pics and the horses. And you three aren’t bad either. It’s always fun sharing your favorite things! Great series! I get the feeling there will be future trips there for the three of you ! I have a feeling Donna will be visiting Corolla again. Great photos, Dianna! Spending time with good friends is always wonderful! 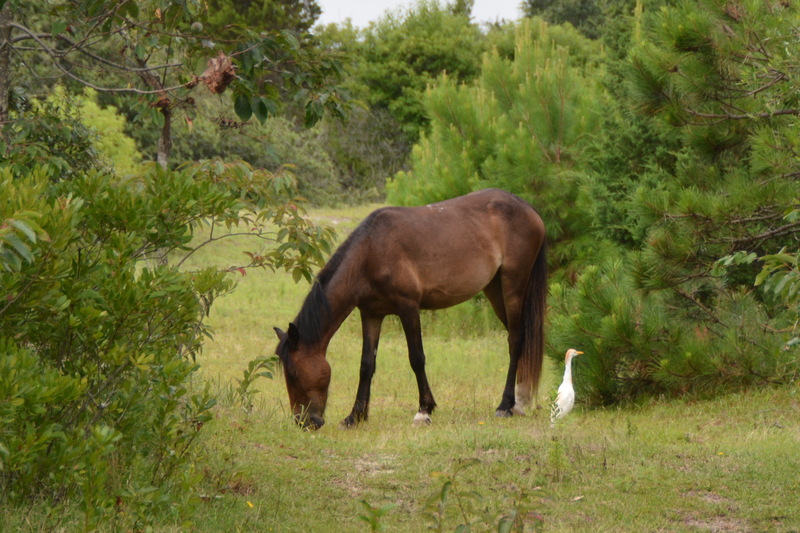 The pictures are great, but my favorite is the one with that beautiful bird standing right close to the horse. Sounds like everyone had a fun day! Great series of photos, Dianna. Lots of great pictures. I’m glad you were able to find some horses to share with Donna. I’ll bet MM enjoyed every minute!